Daily Mirror UK, 2 APR 2019. 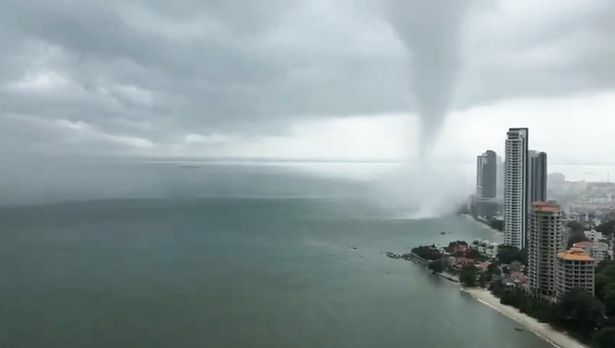 A huge water tornado was filmed spinning towards a city's high-rise buildings - forcing people to run for their lives from from the beach. The 75-year-old said: "The sound of the wind was deafening and I saw part of the roof of my house being flown away by the wind. "It was very scary and took place for the first time in the 50 years I have been staying here." Fried banana trader, 52-year-old Zaleha Mat Zain, said she managed to run to the mosque area and and saw her stall destroyed by the storm. "I am thankful that I am safe. The materials for my business such as banana and tapioca were damaged by the storm." She added that more than 10 other stalls were also destroyed by the storm. Waterspouts have a five-part cycle starting with the formation of a dark spot on the water surface, then a spiral pattern. This is followed by the formation of a spray ring and then the funnel, before finally disappearing.